As a Delaware senator, Joe Biden made a daily commute from Wilmington to Washington DC for work. 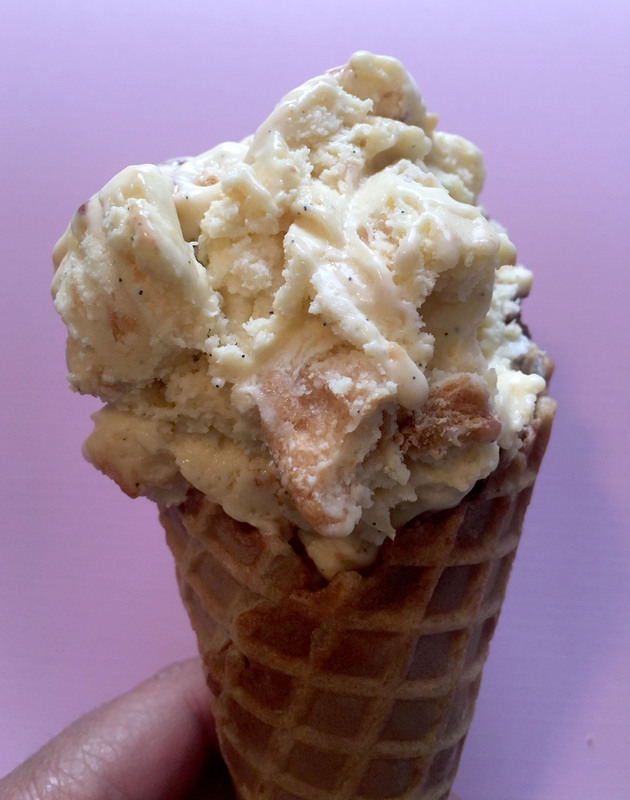 The decades he spent making this trip are the inspiration for this ice cream. Since you don’t get a train commute without train tracks, I thought that I’d create an interpretation of Moose Tracks ice cream. Moose Tracks is a vanilla ice cream with fudge and peanut butter butter cups. Since 2009, Delaware’s official dessert has been the peach pie. With this in mind, I wanted peach pie flavors to figure into this ice cream. So, the Train Tracks ice cream has a vanilla-peach base, and is swirled with fudge and peach pie filling. The base begins the same way a vanilla ice cream would, but peach preserves are added to the custard. I adapted a peach pie filling recipe and heavily borrowed from a fudge recipe for the mix-ins. I also made pie crust crisps by taking a pie crust and brushing it with egg whites and brown sugar and then baking it. As the first Joe Biden ice cream, Train Tracks is in first place so far, undefeated by another. How long can it remain at the top? This entry was posted in Biden Big Scoop Bracket and tagged fudge, ice cream, peach, peach pie, peach preserves. Bookmark the permalink.